Historically, Kampala has been comprised of seven famous hills; as the city has expanded rapidly, however, it’s expanded to cover more than twenty surrounding hills. Today, “go up from there” and “just down from here” are essential commands when giving directions. Kololo Hill is just east of Nakasero, close to downtown. Full of mansions, swimming pools and large compounds, it’s the place to live the high-life and indulge in guilty pleasures (more on that later!). At 1,300 meters above sea level, it’s the highest hill in the city and also the peak Kampala’s wealth. Kololo is a hub for good nightlife, amazing food and access to stress-free shopping. The 18-hole golf course at Kampala Golf Club sprawls through the valley that hugs Kololo’s lush hill and is a hangout for elite Ugandans and successful foreign businessmen and development workers. The neighborhood houses several embassies and is home to many ambassadors. An industrious traveler/budding business-person can shmooze with the who’s who of Kampala’s business and political scenes in Kololo. Kololo boasts the most expensive real estate in Uganda. You’ll have a tough time finding a one-bedroom apartment under $1,500 per month, but it will come furnished with all amenities. Although houses are unfurnished they generally cost between $3,000-6,000 per month. If you’re looking to buy land in Kololo, an acre of land can set you back up to $1.5m. For a bit of context, it cost about the same amount to purchase a gorgeous condo in New York City! Many of Kampala’s nicest hotels are located in Kololo. Kololo’s hotels are luxurious and give you close access to many comforts. Hotel Protea – Beautiful top quality accommodation, food, and service. Around $160/night. Shangri La Apartments – Hotel apartments, stay a night or a month. Around $200/night. Hotel Africana – Wonderful staff, an older building with good accommodation, mixed reviews on food and famously a bit noisy. Around $150/night. Golf Course Hotel – Attached to Garden City mall and has a nice view of the 18-hole golf course. Main attraction is a revolving restaurant at the top of the hotel, which we recommend for the rotational experience more than for the food. Around $150/night. 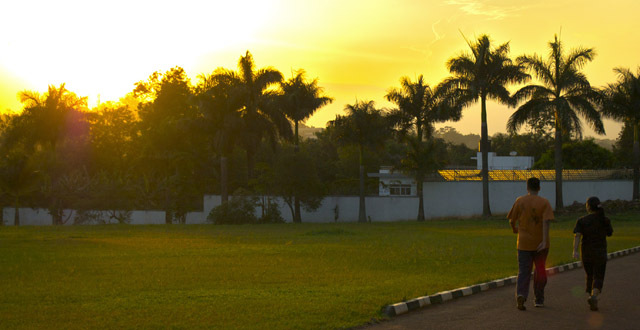 As one of the more peaceful areas in Kampala, Kololo has several options for recreational activities. The Kololo Airstrip (never used as an actual airstrip!) is a great place to take an evening stroll with the family. Children are able to play freely in the large grassy area. You will also find pickup soccer games being played in the evenings mixed with joggers circling the area. And every once in a while, you might be able to catch a game of ultimate frisbee! Kololo hill serves as one of the most relaxed housing areas in Kampala and has a good infrastructure, which makes for a great place for walking or jogging. Be prepared for some tough exercise, though, as you will have to traverse up and down the rather steep paved roads! Another great recreational option is a golf outing at the Kampala Golf Club. The course is set on a beautiful terrain and has a handful of rather challenging holes. This is a great place to network with Kampala’s movers and shakers. You could also go for a swim at the Fairway Hotel or Golf Course hotel. Uganda’s top shopping malls – a mere five minute drive from Kololo – are the perfect places to forgo the chaos of the local markets and to walk through isles of organized, imported food while sipping an iced coffee. Of course, guilty pleasures always entail shelling out a bit more money than the alternative options. Garden City Mall – Uchumi Grocery Store is the anchor tenant. Great food court on the second level with an open view of the golf course and lots of fresh air. Variety of stores, a casino, a movie theater, a bookstore, cafes and an ice cream parlour. Access to banks and ATMS. Lugogo Mall – Check out Game – the Wal-Mart of Uganda. Excellent grocery shopping at Shopright. Pharmacy, eyeglasses store, a great cafe called Good African Coffee, a hair salon named Sparkles, and a dry cleaners. Forest Mall – Brand new mall with stores slowly opening one by one. Cafe inside, sports store, banks, telecom stores, clothing stores, and more. Acess to banking services. No matter who you are, or what you prefer, you can’t leave Kampala without sampling the food in Kololo! There is a diverse variety of cuisine including French, African fusion, Mediterranean, Chinese, Ethiopian and Indian. The Lawns – Beautiful atmosphere, fusion African cuisine, specializes in game meats. La Petite France Restaurant and Rooftop Terrace Bar – Great French food, pricey menu, perfect ambiance, superior customer service, wine bar. Nanjing – Foolproff Chinese food. Khana Khazana – Eclectic ambiance, incredible Indian food. Mediterraneo – The gods of food manifest at Mediterranneo, one of Kololo’s classiest dining options. The unique fusion of Ugandan and Mediterranean ambiance creates the energy and feel of a spacious split-level beach bungalow. White tablecloths and candlelight set the mood while tropical trees peaking in provide the perfect backdrop for a glass of wine and a delicious pasta. Casablanca – Relaxed, candle-lit atmosphere with traditional Ethiopian cuisine and the cheapest and best shisha in town. Centenary Park – A small cluster of restaurants and outdoor/patio seating and entertainment. Home to Efendy’s Turkish Restaurant, 4 Pints Bar and Restaurant (Indian and Chinese food), Barbeque Lounge (grilled meats and veggies, dancing at night), Blue Africa Restaurant (specializing in local Ugandan cuisine), Ache Havana Bar Restaurant (cuban and latin dishes), and Green Garden Restaurant (African Buffet). In addition to all of the tasty restaurants and entertaining nightlife, Kololo is full of fun cafes for relaxing afternoons. Free WiFi is available at many of these destinations (a great way to cut your Internet costs!). Javas – Located at Oasis Mall, great spot for lunch, wifi available at a fee. Endirio – Located in Kisimenti (adjacent to Kololo), lovely atmosphere, great food, free wifi. Mishmash – Cozy indoor/outdoor cafe and restaurant. Great during the day and at night! Free wifi, cool events during the week. Mokka Terrace – Located inside Oasis Mall, atmosphere is kind of lame but you can get a huge, cheap iced coffee and use free wifi all day if you’re nice to the staff! Kololo’s nightlife and shopping are my guilty pleasures. When I’m tired from a long day, Kololo calls my name! Bubbles O’Leary, for instance, the obligatory Irish Pub in Kampala, is full of energetic ex-pats, wealthy Ugandans and top 100 radio hits. The raucous dance parties, cool staff, interesting partygoers, chill patio and safe atmosphere lure me back more than I’ll admit. Bubbles O’Leary – Irish Pub, mid-line prices, small but rowdy dance floor, chill patio, cool people. Boda Boda – Bar/lounge located on top of Garden City Mall, nice atmosphere, comfortable places to lounge, chill, pricey drinks; there is a dance floor… but it’s always empty and awkward. Just Kicking – Great food, cold beer, good prices, great place to meet people. Sports on TV and cool gigs. The Surgery is a hospital (or maybe more like a health clinic) located in Kololo and staffed by experienced physcians who give professional and personal care. If you’re planning to stay in Kampala, outpatient insurance for one year at The Surgery costs $140 and inpatient insurance costs $250 – it’s a worthwhile investment! When malaria, salmonella or parasites strike, instead of feeling sick for weeks before making your way to a clinic, get insurance at the surgery, stop by for a quick appointment and knock-out the problem immediately! There’s even a cozy outdoor cafe called Rocks and Roses in the compound. Brits will be especially pleased to sit at Rocks and Roses and enjoy marmite toast and tea while waiting for an appointment.